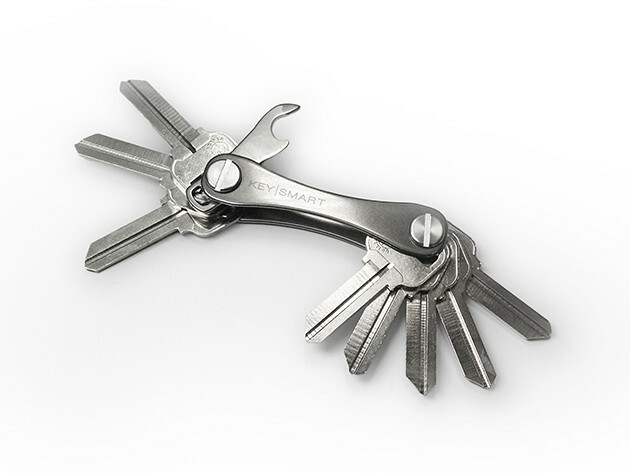 Made of lightweight titanium, KeySmart can keep up to 10 keys, a USB, and more. No matter how much slimmer the other stuff we put in our pockets might get, our keys remain the jangly, jagged mess they’ve always been. At least that was the case, until KeySmart 2.0’s Titanium Key Organizer came slicing into the scene, cutting the clutter and bringing the keeper of our keys up to the slim, sleek standards of the 21st century. It does all that and more, and it’s just $29.99. Like the name says, this beauty of a key wrangler is made of durable and lightweight titanium, able to hold up to 10 keys and a bottle opener in a single, neatly organized unit. The organizer also has room for your car’s fob or even a USB drive, with a special ‘S’ design that adjusts to whatever you need to carry. Plus it’s made right here in the US, in Chicago to be exact, so you can count on quality and a product that didn’t have to cross the oceans to end up in your pocket. Modernize your key-keeping game for $29.99 at Cult of Mac Deals.